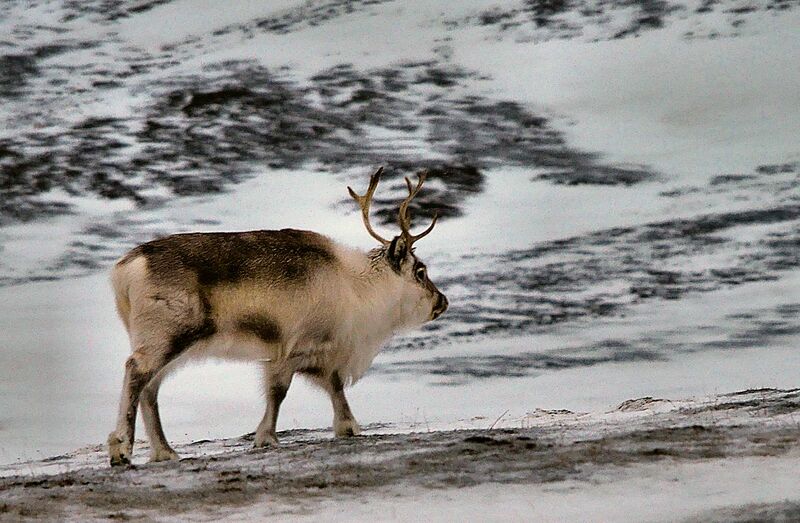 During our days at Spitsbergen, Svalbard we did not meet the Polar Beer - but did see some Reindeers scattered around. The reindeers up here have shorter legs and necks and looks more like a "ball" than the ones we find in the mainland of Norway. Surely due to a much tougher climate. The Svalbard reindeer (Rangifer tarandus platyrhynchus) is a reindeer subspecies found on the Svalbard archipelago of Norway. They are the smallest subspecies of reindeer. Males average 65-90 kg in weight, females 53-70 kg,while for reindeer generally body mass is 159–182 kg for males and 80–120 kg for females. They remain short-legged and have a relatively small, rounded, head. Their fur is also lighter in colour and thicker during winter.The thickness of the coat contributes to the short-legged appearance and makes even starved animals appear fat in the winter. The males develop large antlers during the period from April to July and shed the velvet during August-September. Males lose their antlers in early winter. Females develop antlers starting in June and they are usually retained for a whole year.